Review of Scrapyard Armour Modeling Scenes from a Russian Armour Scrapyard AFV Modeler Publications Ltd.
Pictures of rows and rows of old tanks in the book that were taken out of service, lined up and waiting to be cut up into scrap. Others have already had their turrets tipped off and have been torch-cut into three pieces, causing their nose and tails to droop like decaying animal carcasses. Elsewhere a complete T-54 stands amid the weeds, its turret numbers fading as it slowly carrodes. 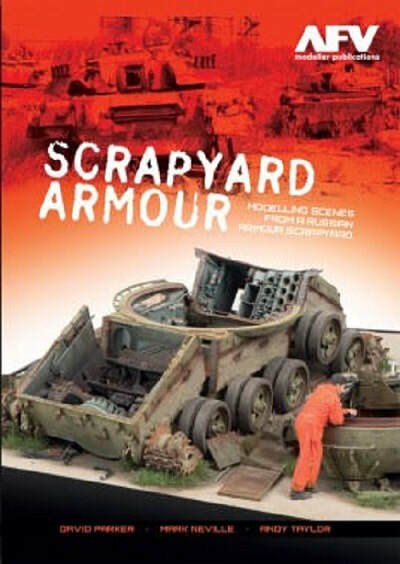 This "Scrapyard" book offers a unique set of challenges for the armor modeler with faded and peeling paint, stripped out vehicles, cut up turrets and of course plenty of rust. Inspiration was found in a series of photographs of one such scrapyard which were brought together here along with the models they inspired, in hope that they will inspire the readers too to take up the challenge of Scrapyard Armor. This book is soft-cover and contains 117 pages in 8 1/4" x 11 3/4" page format. The cover shows a diorama of a Trumpeter 1/35th scale Soviet T-62 that has been chopped up. It has had it its front and rear sections shopped off and they are leaning against the center section. The turret lies upside down next to it along with the gun barrel and some loose panels. A figure in coveralls, wearing a baseball cap, is leaning on the upturned turret and looking inside. This diorama is by David Parker. He has done a lot of extra added detail to the model. The chapter about this has 219 color walk-around type photos of the model as it was progressively built. Very very therough description! The next section of the book is actual color photos of the Soviet scrapyard used for the inspiration of this book. They were taken by Sergey Buyanov at Ussuriysk, Russia. They show a good cross-section of the vehicles scrapped there. There are 76 color walk-around photos of the vehicles there. The next section is on the model done by Mark Neiville. It shows Again the Trumpeter T-62 kit was used. Their T-62 BDD Model 1984 kit is a close match to the picture of the one at the scrapyard that inspired this model. An actural photo of that tank is shown at the scrapyard, followed by 46 color walk around photos of the model being built up showing each step. The final section is the model by Andy Taylor. He built the Tamiya kit of the Soviet T-55AM with a CMK brand resin set of details. However, now he says that Takom makes a kit of the T-55AM that lets you build without needing the CMK set. The section begins with an actual color photo of the tank at the scrapyard that was the inspiration of his model. It shows it sitting in a field slowly rusting away. It has the white turret no. 512 on it. There are 32 coklor walk around photos of the model. All the color photos in the book have captions explaining exactly what is being done. Neat! This book is one of 3 books on modeling AFV kits that AFV Modeling Ltd. publishes. The other two are titled Adam's Armour vol.1 & vol. 2. Two other books are on biplane models and titled Wingnut Wings vol. 1 & vol. 2. I hope to get samples in the future of the Adam's Armor ones from Casemate, who sent me this sample of the Junkyard book. I want to thank Casemate, the North American distributor of AFV Modeler books.